The Implantable Collamer Lens, better known as ICL surgery, is a type of surgery where a pair of lenses is put into your eyes, without removing the natural lens. They are different from regular lenses because they do not need to be removed like regular contact lenses. While similar to contact lenses, they are put into eyes where long-term vision correction is required. The lenses are made to work in tandem with the natural lenses of the human eye to improve your vision. The procedure involves inserting the lens between the iris and the natural lens through a tiny incision which will be near the cornea. ICL surgeries consist of two different procedures which are as follows. The laser Iridotomy is usually performed two weeks before the surgery. To begin, the doctor will apply anesthesia drops on the eyes. The doctor will then make one or sometimes two small holes at the edge of the iris using a laser. These holes are made to make sure that there isn’t any fluid build up behind the implanted lenses once the surgery is over. Fluid buildup can result in glaucoma. Iridotomy takes a couple of seconds. It is done to prevent pressure build-up after the implant is implanted. Before the surgery begins, the doctor will apply anesthesia to your eyelids so that they become numb. The doctor will then use an eyelid holder to ensure that your eyelids stay open and don’t blink during the procedure. The doctor will then make two micro incisions at the bottom of the cornea. The doctor will then inject the lens into the eye through the incisions. The doctor will also put a gel-like substance in your eye so that your eye isn’t damaged while the lens is being positioned. 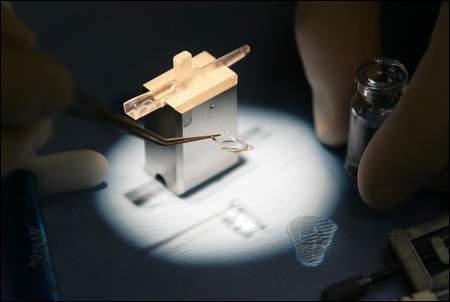 After the lens is in its final position, the gel will be removed from the eye. The doctor will then apply a couple of eye drops to prevent infection as well as inflammation. The doctor will probably ask the person to continue to apply the eye drops post-surgery. The patient will enjoy a difference in the quality of their vision almost immediately after their surgery. The other eye will have to go through the same procedure after 2 to 4 weeks, if they elect not to have surgery on both eyes the same day.